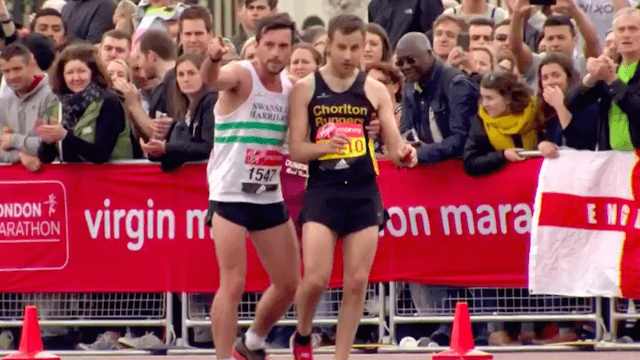 London Marathon runner helps exhausted athlete across finish line, because sportsmanship matters. I've become a fairly avid runner over the past year, but the idea of running 26.2 miles along with a huge crowd—and in front of other huge crowds—is still pretty daunting. How do people have the endurance for such a feat? In truth, not everyone does. And when London Marathon runner Matthew Rees, representing the Swansea Harriers club, noticed that competitor David Wyeth looked close to collapsing just a few feet from the finish line, he swooped in to save the day. "I took the final corner thinking 'right, it’s nearly done, time to sprint,' and I saw this guy and his legs just crumbled below him," Rees told the Press Association. "I saw him try to stand up again and his legs just went down again, and I thought ‘this is more important, getting him across the line is more important than shaving a few seconds off my time." Even though Prince Harry and Prince William were there to applaud his efforts, Rees was humble, saying that his own calf had cramped early on and that he had struggled throughout the day. "We’ve got the exact same emotions but in different ways," he said of Wyeth, "he can’t walk and I have just had an awful race, I just want to get to the finish line and so does he. This is what the marathon is about—it's about people—it’s for everyone. Moments like this make it worth it." Even for those of us watching from the couch.